Good Morning and happy Monday. It's time for the Buffalo Stamps and Stuff Monday Challenge. The challenge this week is to use Alcohol inks to create beautiful designs on glossy white cardstock. There is a great tutorial at ww.splitcoaststampers.com/resources/tutorials/alcohol_ink on creating this great look. 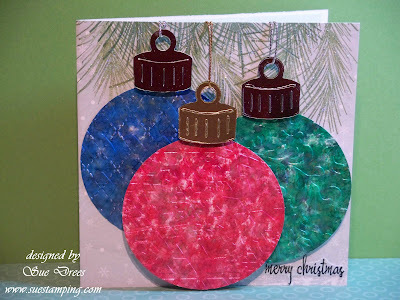 After I created a sheet with each of the colors I chose, I cut out the ornaments using a Sizzix die. Wow Sue this is gorgeous, going to have to look at that tutorial! Love the colours, looks awesome. Hi Sue, I love how you made these ornaments! I have done this technique but never ran it through the Cuttlebug and adding glitter. Very pretty card! So many fantastic new cards here again! I´m so happy with this Award. Very proud too, so fantastic, that you are thinking of me! OMG these are stunning, love the technique and the colours. Thanks for sharing the link, now on my to-do list. Wow what a gorgeous Christmas card. They look so real! Awesome job!